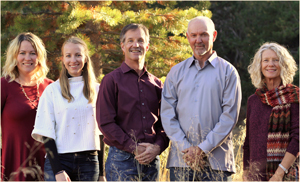 Whether you are hoping to sell or purchase a home in the Lake Tahoe area, Matt Hanson at Tahoe Truckee Homes is your guy. Matt helped us purchase a condo in Tahoe-Donner and we could not have been happier with his service from start to finish. Matt helped us quickly narrow our search based on our preferences, goals and budget and quickly gained our trust. Matt also gave us great insight and suggestions with respect to vacation rental possibilities for our purchase. We made a few trips to Tahoe from the Bay Area to view properties with Matt and he was always very accommodating. This was our first time purchasing a property in Tahoe and it was a relief to find a realtor with so much local knowledge and that was so responsive. We would not hesitate to recommend Matt to anyone looking for a realtor in the area. "Matt worked with us to find our house in Tahoe Donner four years ago, and recently to purchase a lot in Gray’s Crossing. We can’t say... continued"
- Rick & Debbie B.